Dave, If you print a large ref chart it may be as simple as taping it to the side of the pool. You might try just leaving enough extra material so you can tape it above the water line. Depends on the lens and distance your trying to test. John, I can't decide if your last comment was the scurilous hack talking or the intrepid reviewer. Just curious, what percentage of the images that you get sent to you would you consider good enough to print? A large test chart is not needed! Smaller test charts are quite adequate - placed centrally and on the diagonal in the corners and at intervals along the diagonal if needed. The aim is to see the drop in image quality into the corners, not the overall variance in the whole image area. If the lens is correctly centered and aligned the images from the diagonals should show similar results. Laminating an A4 print is fairly cheap - few laminates will stand up to submersion eventually as few use truly waterproof adhesives, but test charts can always be reprinted. The real question we need to know the answer to from the scurilous hack, is whether the images with mushy corners are actually used by the magazine - if they are then lens testing might just be an academic exercise . i now feel i am in a position to truly test my lenses and housing and ports both topside and underwater. I have printed Steve's linked test sheet and will get on a method that shows results which truly compare lenses and port set ups at different distances and apertures. A do think that the test sheet is a little over complicated, maybe i could create a 'wetpixel' specific sheet which has specific spots which need to be tested, i.e corners and edges and central focus? Think we could really get this moving and produce a comparable test for all new buyers out there. Kahoy EcoDivers Resort, S. Leyte, PH. Canon 7D, Nauticam NA-7, Canon 100, Tokina 10-17, Canon 18-55, Twin Inon Z-240s, Anthis Woody Dipotre, homemade snoot. Since art directors love to 'discover' pictures within pictures, thereby awarding themselves the credit for making a picture out of nothing, they love to crop off-centre. To this end I have now equipped myself with a D800 and 15mm so that I can shoot lots of extra space all round my subject. Of course, the dome port needs to give a sharp image across the frame which mine do with fish-eye lenses. However, if you are the one that needs pleasing, make your own mind up if it's sharp enough. I buy my own photographic kit. Diving equipment manufacturers and diving services suppliers get even-handed treatment from me whether they choose to advertise in the publications I write for or not. All the equipment I get on loan is returned as soon as it is finished with. Did you know you can now get Diver Mag as an iPad/Android app? 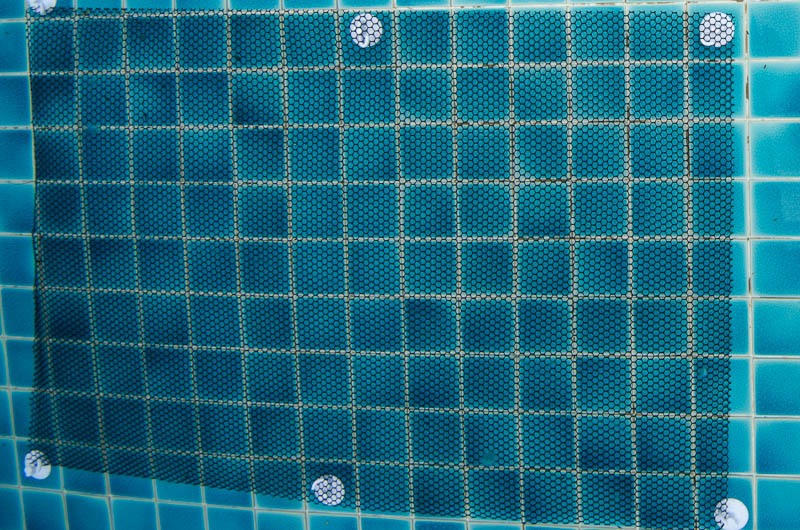 Here's the latest iteration of my plastic garden mesh test chart, 1m x 1.5m, attached to the bottom of the pool with bathroom sucker hooks. This is the Sigma 8-16 at f16 behind a custom 8" hemispherical dome, If it doesn't fill the angle of view, I simply place it in the corner of the picture. I hook my feet over the edge of the pool to get more stability floating on the surface. Attached to the side of the pool might be better for camera shake. When I built housings, I was always careful to build the domes so the centre of curvature coincided with the apparent front entrance pupil of each lens. I liked the 18mm f2.8 a lot. The corner looked good to me, but I was looking at a slide with an 8x loupe. With the advent of digital and zoom rectilinear lenses like the 12-24 and 8-16,the corners seemd bad, but then I was looking at them at 100% on a good monitor. I tried the 18mm the other day on the D7000 with the 9" Nauticam dome and the corners were far better than I can get at an equivalent aperture with the 12-24. But on a crop sensor the 18 is not usefully wide. I will be interested t try it on a full-frame camera sometime. I produces some really interesting results, and really shows where lenses fail on the corners. The guy the owns it (Pawel Achtel) has created a rig that locks the camera in place too so that the results are repeatable. He used it when testing the resolution of Nikonos lenses for his Deep X rig. We will be also testing my Gates Deep Epic with the Tokina 10-17, 11-16, Canon 16-35L, plus we have some other results with Zeiss MkII behind Aquatica domes. I'm sure if anyone is based in Sydney and had any more lenses and port options we could organise something. A very inexpensive test chart to do, at whatever size you want will be a simple white 3mm thickness PVC board (I use one with around 1 m wide). Then one simply mark (at the edges) 5 or 10 cm spaces all around. To make the grid (to focus or to evaluate edge sharpness or lens distortion - optical or chromatic) just use black electrical tape. It's quite easy and quick to make lots of horizontal and vertical lines (the grid) and two at the diagonals. Then you can put in in the pool floor or (better) at a pool wall (just make tho small holes at the corners and suspend it with some line and weights (out of the water) at the pool side. You can even use a tripod with a quick release plate so you can repeat results at exact the same distance while you change lens/port/extensions. This is a great idea. Along with standards for target and shooting distance how about the same for target illumination? I happen to write procedures for work and would be happy to contribute to a writen testing procedure. The inclusion of illumination tests will be welcome and useful for someone who is not sure about what to buy or just wants to knows exactly the light quality and intensity of one's strobes/video light. Did this thread ever get anywhere.. it seems to have died a death? I am having some dome port dilemmas which a Sea & Sea MDX 5II and a 16~35mm USM L lens and I was hoping to find a conclusion here. There are lots of good ideas here, Is anyone interested in trying to resurrect this? I can knock up a test chart and share it, if we can agree on some content... I propose a combination of the mesh idea of Pete Atkinson and smaller charts positioned at key places. The problem of too many lens/domes/strobes on the market will be a challenge to test everything. I've done my tests with my Subal gear and my lens in order to exclude /include some bad/good combinations and to have a good feel of distances/magnifications that each combo can deliver. I've used the test chart I've mentioned above. I don't mind to where some thoughts and some personal conclusions if there are some more people that have done the same thing, so we can start some sort of database. But of coarse that it will be just a starting point, because I believe that each photographer should do his own test with is own gear. Edited by Rui_Guerra, 13 January 2014 - 10:05 AM. Has anyone tried a 35/1.8 or 50/1.8 in a small dome (like the zen dp-100)? Just wondering...I have a 10-17 but just thinking about how some of my other lenses might do.